Tara Ruby really wanted to breastfeed her baby longer than eight weeks but her duties as a US Army soldier from 1997 to 2001 made nursing too challenging to continue. Ruby’s husband is still on active duty assigned to the 1st Armored Division at Fort Bliss in El Paso, Texas, so Ruby keeps up with life on the base. When Ruby learned the base had established an officially designated room — the Butterfly Room — for new mothers to nurse their babies in comfort and privacy, Ruby wanted to donate her talents to what she considered a worthy cause. Ruby is a photographer now and she wanted to take a photo of a new mom in uniform nursing her baby. She thought hanging an enlarged photo of this nature on the wall of the nursing room would be a “normalizing” gesture, helping women to feel comfortable doing such a feminine thing in the midst of such a masculine world. Questions of Army policy and public affairs regulations arose so Ruby and the other people working to put the Butterfly Room together took their photo idea to Fort Bliss authorities. The team mentioned their expectation to post the hoped-for photo online and acknowledged doing so would generate feedback. Ruby put out a call for volunteers to meet her one recent Thursday afternoon after the day’s military duties were done. She was hoping one or two mothers would bring their babies and participate in the photo shoot she’d scheduled for the Butterfly Room photo she wanted. 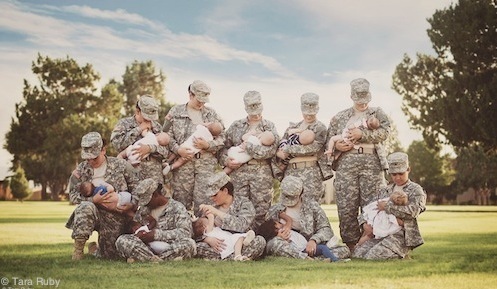 To her surprise, ten soldier moms showed up in uniform with their babies in tow, eager to take part in Ruby’s photography session. Instead of one photo of one mother nursing one child, Ruby’s photo became a group photo that included all ten mothers nursing their ten babies on the base’s main parade field. Ruby’s photo was never meant to showcase an individual soldier so all the women in the group photo are looking down at their children, not at the camera. All babies are positioned with their faces away from the camera, too. “My intent is to show unity between the women and their children. This isn’t about an individual soldier. Nobody’s looking at the camera. This is literally about the fact that they can be a soldier, they can be a mother, and they can do it all at the same time,” explains Ruby. The photo did get posted online, as expected, first on Facebook, where it was immediately removed. Ruby reposted it the next day and this time it stayed. It’s now the banner photo on Ruby’s Facebook photography page. But the photo didn’t stop there. It took the internet by storm, quickly spreading in viral fashion to social networks, news organizations, and from person to person faster than Ruby could keep up with it. Why is the photo getting so much attention? “This is something people need to talk about or want to talk about, and I just gave them a voice through a picture,” Ruby said. Tan, Michelle. "Photo of soldiers breastfeeding in uniform goes viral." Army Times. TEGNA, 14 Sept. 2015. Web. 23 Sept. 2015. "Military Breastfeeding Policies." Breastfeeding in Combat Boots. Breastfeeding in Combat Boots, 2015. Web. 23 Sept. 2015.